Something there is that loves a deadline. We're down to the wire on picking our top 10 picture books for Fuse #8's Top 100 Picture Books of All Times Poll -- the deadline is midnight tonight. I gave myself 15 minutes in front of the picture book shelf in my classroom to make my picks. Instead of agonizing over my list, I was quick and impulsive. Even now, I am refusing to allow myself the right to second guess. 10. A River of Words by Jen Bryant, illustrated by Melissa Sweet. This is my newest favorite. I can't wait to see how Melissa Sweet's style evolves. 9. The Relatives Came by Cynthia Rylant, illustrated by Stephen Gammell. This is one of my oldest favorites. It has been fun to see how Cynthia Rylant's career has evolved. 8. Traction Man is Here by Mini Gray. Toys that come to life in our imagination. Nothing better. Takes me right back to my childhood. 7. And the Dish Ran Away With the Spoon by Janet Stephens, illustrated by Susan Stevens Crummel. Love all the literary (kid-sized) humor they embed in the story and the illustrations. A fork in the road -- brilliant! 5. Little Mouse's Big Book of Fears by Emily Gravett. Well, everything by Emily Gravett, actually. Did I mention (once or twice or twelve times already) that I got to see her sketchbook for Little Mouse at the Notables session at NCTE last November? It was WAY cool!!! 4. The Three Pigs by David Wiesner. I love how he got everyone thinking about breaking the boundaries in picture books. 3. The Grey Lady and the Strawberry Snatcher by Molly Bang. Still my favorite wordless picture book (and I have A LOT of favorites). There is no such thing as my single, all-time, one-and-only favorite picture book. Sorry if you're disappointed, but it was all I could do to number the rest of them in some semblance of favoritism. That's as good as it gets. Deal with it. I had two experiences during spring break last week that have interesting implications for the classroom. What's an example of learning or assessment from your life that you can share with your students? I agree wholeheartedly with Bud the Teacher who recently said of the National Council of Teacher of English (via Twitter) "They're on fire." I have to say that I have been especially proud to be part of NCTE these last several months. They have published some amazing work and seem to be taking a stand to support the kind of education that all students deserve. I see lots of potential in these documents--they can all be used to start conversations with colleagues and to begin to examine the way we are doing things in schools. If you haven't had time to really dig into the newest documents, I would highly recommend reading them and finding time to talk to colleagues. The focus on literacy as it relates to 21st Century is key to my personal thinking about learning in classrooms. I worry that too many of these conversations are about the "bling" of the technology rather than the bigger concepts behind this thinking. These NCTE documents can generate great discussions in schools. They've also provided me an anchor for my own personal reflection. 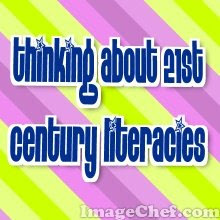 In February, NCTE adopted "The NCTE Definition of 21st Century Literacies". The definition is one that goes beyond tools of the 21st century and helps me define my role in these changing times. In November, the Executive Committee adopted 21ST CENTURY CURRICULUM AND ASSESSMENT FRAMEWORK. I was part of the group that worked on this and learned so much in the process. I see it as a great document for reflection--questions to ask myself about my teaching. I can also envision using it with staff--How are we doing? What are our strengths? What are our goals? etc. A position statement that I continue to go back to when thinking about 21st Century literacy is the NCTE BELIEFS ABOUT THE TEACHING OF WRITING. As the genres in our students' world expand, the beliefs about writing stand true. The kinds of writing they produce may be different but the process remains. If you have not had a chance to WRITING IN THE 21ST CENTURY by Kathleen Blake Yancey, it is a great piece that came from her closing address at the November Convention. It is a key piece if about the historical changes in writing and what that means for us today. Two more important documents--worth reading and thinking about are THE GENTEEL UNTEACHING OF AMERICA'S POOR by Kylene Beers and WRITING BETWEEN THE LINES-AND EVERYWHERE ELSE. In the first piece, Kylene brings up issues that we can't ignore as teachers. A hard piece that is so necessary. The second discusses the differences between in-school and out-of-school writing. Finally, keep your eye open for news and information on the NCTE sponsored NATIONAL DAY ON WRITING in October 2009. What does it mean to be a writer today and how can we support this idea in our communities? This will be a huge day and a day that all of us are invited to participate in. You can get the word out with this information. For me, these documents all go together. They help me define and revise my own thinking. They've also invited lots of great conversations with friends and colleagues who have read them. They are where so much of our thinking is and have helped us move forward. I hope they do the same for you. Each one stands on its own as an important piece of thinking. Together, they can give us a vision of where we can go as literacy educators. 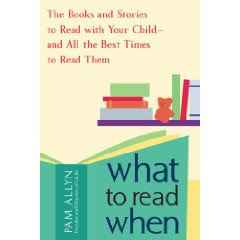 I just got a copy of Pam Allyn's new book on choosing books for kids called WHAT TO READ WHEN: THE BOOKS AND STORIES TO READ WITH YOUR CHILD AND ALL THE BEST TIMES TO READ THEM. I came home from my perfect beach vacation and was thrilled to see this book in my pile of mail. I spent hours with the book last night--instead of doing the laundry I should have been doing from the trip! This book couldn't come at a better time for the Kidlitosphere with the Share a Story Campaign-Shape a Future having just happened! Jen Robinson and others have been busy working to encourage read aloud. In Pam Allyn's introduction to WHAT TO READ WHEN, she says, "The same way we choose foods to suit our moods--hot soup on a cold winter's night, spicy ribs for a family picnic--we long to choose the 'just right' books that will match the moments we find ourselves in with our children." Pam talks about the important role books played in her childhood and the important place reading and sharing books has in her relationship with her daughters. When I think back to my own childhood and the books that have been saved, I know my mother had the same thinking--I have a book about moving day, one about bad days, one about becoming a big sister. My mother-a teacher-also knows the power of story and conversation --the right book at the right time. As a mother, I find myself looking for books that will help my daughters make sense of the things they are working through. Books have been critical to me in the way I see the world and I want that for kids. That is one of the reasons I am thrilled to see this book. So often, the only way that "just right" books are defined is by reading level. For so long, we have almost forgotten other reasons that a book can be "just right" and in this book, Pam Allyn reminds us that books are about more than reading development. The book covers a lot for parents. Part I of the book is dedicated to "The Power of Read Aloud"--why we need to read aloud to our kids and how to do it well. Part II focuses on great read alouds for every age. Pam shares her understanding of child development and the kinds of books kids love at different ages and stages. Finally, Part III is titled, "The Emotional 'When': Fifty Essential Themes". In it are booklists that match so many moments in life--both big and small. Included themes are Birthdays, Being Yourself, Falling Asleep, Death, Loneliness, Adoption, Bath Time, and more. For each of these themes, Pam gives us a great list of books--including old favorites as well as great new titles. She gives us summaries of the books as well as talking points and questions to start discussions with our kids. I can't begin to tell you what a resource this is. "Should I still be reading aloud to my child after he or she is reading independently?" "Should I give rewards to my child for reading?" "I know my child can read Harry Potter because he can sound out alll the words on the page. So why does he seem unable to finish the book?" This book will be a must-have resource for parents, teachers and librarians. I am very excited to have it--after owning it for less than 24 hours, it already looks a bit worn--tabs, notes and post-its everywhere! I will be going back to this one often! I wrote an article for Choice Literacy titled, "What Does It Mean to be a Literacy Teacher Today?". It is the first in a year-long series called "Beyond Gadgets" focusing on integrating technology with literacy learning. Another round of great sites I've found that help me think about 21st Century "stuff". In no particular order. Just some posts that helped my personal thinking recently. MEET ME AT THE CORNER is a great site for kid videos. I have been looking for videos that kids can study as "mentors" when they create their own. This site is full of not only kid-friendly videos,but videos made by kids, videos on how to make videos, and more. A great resource if you are thinking of movie-making with elementary students. KIDS WHO THINK is a blog that I love. Fun weekly challenges invites kids to use their creativity. So many great ideas--Kids are sooo smart! I worry that we are missing this kind of learning in schools and this reminds me how critical these experiences are for kids. Will Richardson shares his observations after his 10 day trip to Australia. The kids in charge of the learning. He visited the Wooranna Park Primary School. This school makes me sooo happy. There is a great video that summarizes the way the school works on the site. To me, that is the key to 21st Century learning. Kip's post Time to Reflect was key to me in my thinking of how to infuse more technology into my days. The debrief and reflecting is key in our day and I worry that we are losing that in our hurry to "teach" things. I can see the share and debrief as the critical piece of a workshop with new tools. No matter what tools are available to students, the reflective share is key. For those of you who have not ventured to Twitter yet. Ryan Bretag has a 30 Day Twitter Challenge posted. He has some great advice for those of you missing out on the fun! At 59 Minutes, a thoughtful post about the reality of making the changes in the classroom that we often learn about at conferences. was recently posted which includes some interesting tours and thoughtful practices. One of the posts that solidified some of my own thinking was from GENERATION YES BLOG titled "Educational Technology Doesn't Work". I continue to worry that anything on the computer is being tagged in the same category. For me, the key to quality instruction with 21st Century tools is about creation and information. Games and online worksheets cannot be put into the same category. But that seems to be what is happening in many cases. At Creating Lifelong Learners, there is a great post about priorities in technology purchases. So many tools are coming out so quickly and deciding which will have the most impact for students is a challenge. For me, it is always about student creation and I appreciated the premise of this post. Very smart and helpful. "The process of integrating technology into our libraries and classroom spaces seems daunting at first, much like climbing a mountain or eating an elephant - but if we simplify the process, start small and work our way up and out, great things can and will happen." If you have not seen the "We Need a New "R" Word" video created by 16-year old Noah Gray and all of the follow-up work this group is doing, today is the day to make time to watch. Take some time today to watch this video and others created by people around the world as part of this campaign. 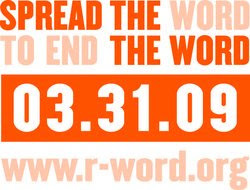 "It is time to “Spread the Word to End the Word,” and on Tuesday, March 31, events throughout the United States and around the world will make people stop and think about their hurtful and disparaging use of the word “retard.” "
As part of the campaign, Laura at "25 Days to Make a Difference" is hosting a Blog Carnival. As teachers, helping students see the power of their words is critical. Here at A Year of Reading, we believe books are one of the best ways to start conversations and to help all of us understand the world. We are taking today to share a few of our favorite books that we would use in the classroom inviting long-term conversations about hurtful words. These aren't all books specifically about intellectual disabilities but the conversation is the same. I love the idea of this day. I also know that conversations like this can and should be ongoing throughout the school year. Books are often a good way into these conversations as readers come to know and love the characters they read about. Here are some of the books we've used in the past that help begin and continue conversations about the power of our words. 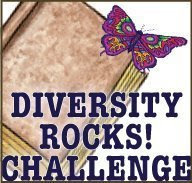 **We are posting this today, a little early, in hopes that many people from the Kidlitosphere join in on the Blog Carnival to support this important campaign. I'm called Saturn in the U.S. I'm Vauxhall in the U.K.
'cause I was bought today! I speak your dialect of Horn. Today was such a proud day! When we drove she called me "fine." She began to call me Mine. The round up this week is at The Drift Record of poet Julie Larios. I just finished my first Kindle Read. 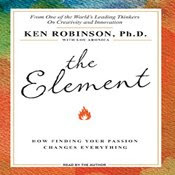 Can I say how much I LOVE the Kindle and how happy I am to have read THE ELEMENT by Ken Robinson and Lou Aronica? One of my favorite features of The Kindle is the highlighting feature. While reading, I can highlight a passage, take a note, and then have those all stored in one place on my Kindle for later reference. So, after reading this book, I was able to quickly revisit all of the lines and passages that really resonated with me. THE ELEMENT is a great book. I have always been interested in people's creativity and passions and that is what drew me to the book. I am always amazed to meet people who have some unique passion. And I am always interested in how to support this idea in schools. Through reading this book, I did lots of reflection on not only my work with students but about myself and the current climate or our communities. A very thought-provoking book that I would highly recommend. The premise for the book is this: "We need to create environments-in our schools, in our workplaces, and in our public offices-where every person is inspired to grow creatively. We need to make sure that all people have the chance to do what they should be doing, to discover the Element in themselves and in their own way." I have been lucky to spend lots of my life doing things that I love. But I have worried for a while about the impact on our kids who have gone to school in this testing era. I worry that they leave high school without having a passion or an interest in something because they haven't had the opportunity to know the possibilities. I feel like much of our work in schools should be about opening the possibilities for our students--letting them discover who they are and what is possible out there for them. The Element helps us think through the issues of creativity. They book defines creativity as "the process of having original ideas that have value" Much of the book is spent examining creativity--what it is, why it is important, why standardized IQ tests miss so much about a person's intelligence. Some of my favorite chapters of the book dealt with Tribes--connecting to others who see the world as you do. People who share your passions. I rely completely on the people who I can think with and I want the same for my students. The authors share with us so many examples of people who have found their passion outside of school. The patterns of doing work they love and the impact on their life are so interesting. The end of the book focuses on implications for schools. We hear about several schools that value creativity and individuality. The authors argue for customized, rather than standardized education for our students. They state, "The stakes could hardly be higher for education and for all who pass through it." This book is a must read. I imagine I will reread it soon. So much to think about as teachers and members of so many communities. How do we support each other in finding our individual voices that are so critical? Again, I am not sure how I missed this one since it's been out since January! But the new Stink book is quite fun. STINK-O-PEDIA:SUPER STINKY STUFF FROM A TO ZZZzzzz by Megan McDonald is quite a treat and will appeal to lots of readers. The book is technically nonfiction--filled with lots of true facts from Stink. It is set up in alphabetical order (since it is an encyclopedia) and has a variety of visuals throughout. In the same style as the Stink books, this book is full of fun illustrations, diagrams, comics and more. The information is inspired by the Stink and Judy Moody books and includes "Guinea Pig Mania" and secret codes. You find out early in the book that there are exactly 20 spelling errors throughout the book and as a reader, you are challenged to find them! The book is full of fun facts. So many of my students love to check out nonfiction that is filled with interesting trivia. This book will appeal to them and I think they'll be able to read this one cover to cover--unlike some of the others that they just browse. I can see this book also appealing to kids who don't know Stink--those Diary of a Wimpy Kids fans may be drawn to this one. I am pretty excited about this new Stink Book and the creativity that McDonald used in creating it. I think this is a great way to get to know a favorite character in a whole different way. 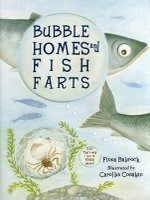 Welcome, Fiona Bayrock, author of Bubble Homes and Fish Farts! We are delighted to be the third stop on your week-long blog tour. On Monday, Fiona was at The Well-Read Child. Tuesday's stop was at Abby (the) Librarian. Thursday, she'll be at Celebrate Story. And she'll end the week at Becky's Book Reviews. My 4th graders saw this book on my desk and they were dying for me to read it to them -- talk about a catchy title! a title that's fresh and unexpected - bubble+home and fish+fart are both unusual combinations not seen in a book title before, way more interesting than plain old "Animal Bubbles", which is accurate, but *yawwwwn*. a title that matches the tone of the book - in this case, light and fun. Can you say "fish farts" without smiling? If it had been a more serious book, I would have chosen something else instead. Bubble Homes and Fish Farts accomplished all that in a way none of the other combinations from the book did. Why did you “hide” the section about fish farts? Hee hee...it does look like I hid it, doesn't it? But, actually, the placement in the book just happened to work out that way. As with most list books, the order in Bubble Homes and Fish Farts isn't random. The animals are grouped according to function: movement, warmth, finding food etc., and where possible, the sections are linked in some way. The whale and seal spreads talk about using bubbles to catch fish—a great lead-in to herring—so the fish farts come after those spreads, which ended up coming where they do as the result of much rearranging to create the strongest logical flow. How did you decide what animals to put in this book? I started with a list of all of the animals I could find that used bubbles, and then pared it down to include one animal for each distinct purpose. It wasn't a long list, and as luck would have it, didn't contain a lot of duplication. When two similar animals had a similar purpose to their bubbles I chose the more interesting one (backswimmer over diving beetle, moth over grasshopper), or the one that wasn't already represented on the list. e.g. both dolphins and beluga whales play with bubble rings, but I already had a "whale", so the dolphin was in and the beluga out. One animal from the original list was cut when the research didn't support the bubble use the preliminary research had shown, and a few animals were added along the way as I became aware of their bubble use during the research process (violet sea snail, water shrew, and star-nosed mole). To get the initial list, I entered various animal names and "bubbles" into an online search engine and thumbed through the index of several large resource books about animal survival and adaptation. Then I used a combination of sources: journals, videos, local library books and interlibrary loan (I heart librarians! ), and specific online sources such as NOAA, National Geographic, university labs, research papers, and Notes from the Field (my fave was by an Antarctic researcher during one of her research trips). Once I'd done all the research I could, I turned to experts, one or two for each animal, to fill in any missing details. They checked my similes for accuracy, and helped me understand the sensory aspects (the frog really does sound like "fwap-fwap-fwap-fwap" and the pile-driving like a church bell). Some invited me into their labs or provided further material not available to the public, such as crittercam footage or photos to show what it was I was writing about. That was extremely helpful. I researched and wrote half the book in a few weeks of solid work. That included the "easy" animals—the ones I was already familiar with and for which the research and experts were readily available. The second half of the book took a lot longer (over 18 months) partly because the animals were more obscure, and took more digging and waiting for materials to come via interlibrary loan and scientists to come in from the field, but also because I was working on other projects at the same time. If you'd asked me this question as I was writing the book, my answer would have been whichever one I was working on at the moment. Now that the book is complete, I still don't have one that stands out. Usually I do have favourite parts in whatever I'm working on, but I guess the bubble connection made for a list of animals that were interestingly quirky in their own ways, because I enjoyed writing about them all. It was a happy day when the book was expanded from 32 to 48 pages so I didn't have to cut any. Nope. I kind of fell into it. I knew from a very young age that at some point in my life I would write a book. I didn't know what it would be about, whether it would be fiction or nonfiction, or for adults or children, but I thought it would be in *addition* to a career in another field, not the career itself. Now that I *am* a writer, I can't imagine myself doing anything else. Sometimes life throws you a curve ball and you catch it. I always have several book and magazine projects at various stages. Right now, that includes mostly quirky cool animal science, with one project focusing more on the scientists, and one involving an experimental format. Thank you, Fiona Bayrock for answering our questions and for including us on your tour!! Gregory K., at GottaBook, announced his project, 30 Poets/30 days: "Every day in April, I'll be posting a previously unpublished poem by a different poet." Tricia, at The Miss Rumphius Effect, is sharing her interviews with "the most amazing writers of poetry for children on the planet." She'll have 36 interviews in 30 days. Jone, at Check it Out, will be doing a variety of poetry projects with students in her school, as well as challenging herself to write 30 poems in 30 days for a 3rd year! Anastasia Suen, author of PENCIL TALK AND OTHER SCHOOL POEMS, has started a new blog just for students' poems about school. She'll feature a student's poem every day in April. Here at A Year of Reading...well, we're on spring break, so our National Poetry Month plans are a little fuzzy right now. Or fizzy, as the case may be. We're pretty sure there will be some kind of poetry post every day in April. Book reviews, links, Irish Dancing, original poems, student work, and 21st Century Poetry are all possibilities. Stay tuned. And Monica, at Educating Alice, is having lots of FUN with BOB. "that we should march to our own drummers. Then she said, "Watch and learn." And right there in front of us, even though we didn't know her very well, she put on her white snowball slippers and marched around the classroom." Dessert comes from a food family -- her parents own a fondue restaurant. Put food family together with a girl who's learning to march to her own drummer and you get the dessert first of the title -- Dessert convices her mother to serve dessert first, and when everyone cleans their plates after dessert, the experiment becomes the norm. When Mrs. Doody announces the Doody Drive fundraiser that will make money to build a treehouse at Lambert Elementary, readers know WAY before Dessert what sacrifice she will make, what beloved thing she will give up for two weeks in order to earn pledges for the fundraiser. But just in case we don't know exactly how hard it will be, we get to watch Dessert succumb to the call of a box of Double-Decker Brownies and then figure out a way to atone for her mistake. This short novel will leave readers in grades 2-5 hungry for dessert and for more stories about Dessert. J. Patrick Lewis generously shared the galleys of his new collection of riddle poems, illustrated with (pardon the gushing) precious illustrations by Lynn Munsinger. This fall collection (Chronicle Books), titled SPOT THE PLOT: A RIDDLE BOOK OF BOOK RIDDLES, contains thirteen riddle-poems whose answers are children's book titles!!! The round up today is at Wild Rose Reader. Yesterday I set Florian's Dinothesaurus and Lewis' The Underwear Salesman out on the chalk tray in my fourth grade classroom at the beginning of the day to shouts of, "YAY!" and "Can I read that during reading workshop?" Neither book made it back to the chalk tray during reading time -- both were read by individuals or with partners and passed from hand to hand to hand the entire time. Surely you've seen the sneak peaks of poetry and art from Dinothesaurus at Douglas Florian's blog? If not, get over there right now and take a look! 18 dinosaurs are described with wit, wordplay, and creative multimedia illustrations. There is a pronunciation guide for each dinosaur name (thank you, thank you, Mr. Florian!) along with the meaning of the name. These name meanings are rich for conversations during word study around root words. Seismosaurus (earthshaking lizard) and seismograph; Tyrannosaurus rex (king of tyrant lizards) and tyrant and rex; Troodon (wounding tooth) and Iguanodon (iguana tooth) and orthoDONtist. The collection also includes a Glossarysaurus, a list of dinosaur museums and fossil sites, and a bibliography with suggestions for further reading. Every illustration adds an additional layer of meaning to its poem and makes this a book that will bring readers back again and again. More wit, wordplay and multimedia illustrations to be had in this volume as well! This book is packed with short poems (a couplet for the job of exterminator), brief poems (for the job of underwear salesman -- ha ha!! ), vertical poems (for the job of elevator operator), poems that take to the streets (for the job of marathon runner), poems in two voices (for the jobs of talk show hosts and ventriloquists), poems that flop (for the job of gymnast), and poems that soar ( for the job of bridge painter and skyscraper window washer). At the risk of being repetitive: Every illustration adds an additional layer of meaning to its poem and makes this a book that will bring readers back again and again. I am a huge Wendy Mass fan. I became hooked when I read JEREMY FINK AND THE MEANING OF LIFE. 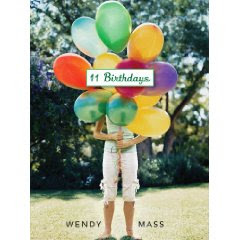 I've finally read one of her new books, 11 BIRTHDAYS and I loved it too. Amanda and Leo are best friends. They were born on the same day, in the same hospital and have been best friends their whole lives. But when they are 10, they have a misunderstanding and stop speaking to each other. I don't want to give too much of the story away so I gave you the basic set-up. This book is about friendship and consequences. I see it as a great book for reading aloud to third and fourth grade. It would also make a great booktalk book for grades 3-4-5. There is lots to talk about and so much that kids will be able to relate to when it comes to friendship issues and misunderstandings. The concept of the book is a fun one, the characters and their friendship is very believable. Wendy Mass has a really amazing understanding of kids this age. To me, this book seems to be for a bit younger audience than JEREMY FINK--more 3rd through 5th grades. 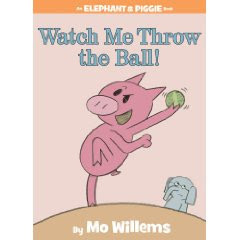 It is a fun read and one I am anxious to share with kids! I was so excited to get a copy of the new Scaredy Squirrel book from my friend Larry in Canada. What a good friend to send me my favorite books hot-off-the-press. 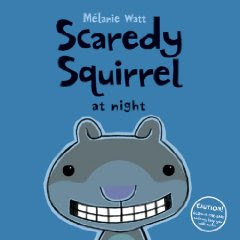 -Scaredy Squirrel's glow-in-the-dark teeth against the dark of night on the cover are a fun way to start the book! Warning: Scaredy Squirrel insists that everyone check under their beds before reading this book. -We get to see SS in his pajamas--such a cute little guy! -Scaredy takes up scrapbooking to keep from falling asleep. I find that quite amusing. -The humor is similar to the humor in the other books about SS. You can't help but smile throughout. A great addition to books about our favorite nervous squirrel. Can't wait to share it in the library! I have spent the last several months really thinking about what the 21st Century Thinking means for me and for schools/classrooms. I have been reading, thinking, and looking for examples of this thinking that fit in with my beliefs about how we learn. I have been on a huge learning curve and am so excited about all that I am finding. Here are some things that I found recently. I have been looking long and hard for great examples of authentic uses of technology with elementary students. The samples of quality work is hard to find. I was thrilled to find THE MEDIA SPOT. This is such a great site with information for educators as well as lots of sample videos in many genres that can be used to think about the possibilities and to share with students. I love this post by Katie at Creative Literacy. Using iMovie: Literacy Alive in the K Classroom. In it she shares a gift that she received from her child's Kindergarten teacher last week--an emailed video of her child reading aloud a book he had written in Writing Workshop. In it, I see so much potential for not only assessment but parent education. With the focus on tests, scores, and numbers, the technology that is readily available now gives us the opportunity to create these types of things to share information with parents. And what a great way to invite conversations at home between parents and students. I also love this post by Kip about 21st Century Literacies in an Elementary Classroom. He shares his own thinking about technology working in his workshop and shares the things that are working at the elementary level. Another site with great videos to share with kids and to think about possibilities is SAM ANIMATION. I want to spend some time exploring the software on this site to see what is possible. Some pretty amazing ideas. I love this post by Kim Cofino called CONVERSATION STARTER. She shares her thinking: "Using technology in the classroom is a mindset, not a skill-set." Such smart thinking with all of the technology being used for the sake of technology. A great piece to use to think from and to use with colleagues. Another great conversation starter is the post called IDEO's 10 TIPS FOR CREATING A 21st CENTURY CLASSROOM EXPERIENCE May be a list I start carrying around with me. Some great points about education today. This post by Doug Johnson called "CONTINUUMS OF LIBRARY USE" has really helped me think about the role of the elementary school library. What should we be moving to and how do we get there. I like this continuum, not only for libraries, but about learning in general. At BuckEnglish, I read some of the best thinking I've seen around the Paperless Classroom. A paperless classroom is about so much more than saving paper. It is about rethinking the role of the teacher and how the classroom actually works. IMPROVING THE INQUIRY PROCESS at The Librarian Edge is a post worth spending lots of time on. So much packed into one post about the Inquiry Process, self-reflecting on teaching and learning, etc. In CHANGING RULES OF THE LITERACY CLUB at Education Week Angela Maiers shares her (very smart) thinking of the changes in The Literacy Club since Frank Smith's first writing on the topic. We can no longer hold onto our old definitions of literacy. What does this mean for us, for our students and for our schools? And when I was told that I was "underusing" my iPhone, I put an effort to using more applications, etc. But who knew that THIS was possible? And I believe in free will." Tricia has the round up this week at The Miss Rumphius Effect. Franklin Lorenzo Piccolini (aka Frankie Pickle) is a kid with a runaway imagination. The simple act of reaching for a toaster waffle becomes a scene from an Indiana Jones movie, and when he's sent to clean up his room and finds his GoGo Robo buried in the dirty laundry, it's suddenly time for WonderPickle to save "the metropolitan metropolis of Metro City" from the attack of GoGo Robo, resulting in an even messier room. Surprisingly, his mom agrees with him that if he doesn't want to clean his room, he doesn't have to. She simply says, "Whatever happens, you have to deal with the consequences." Finally, it gets to be too much even for Frankie and he deals with all the consequences, right down to taking a bath that results in water that looks "like milk did from Frosted Cocoa Loops." This graphic novel hybrid is sure to be a hit with elementary kids in grades 2-5. I asked two of my graphic novel readers to check it out and they loved it. The way the story changes visually when Frankie's imagination takes hold reminded them of Baby Mouse. They liked the fake-brand-names-that-sound-real, like Frosted Cocoa Loops, and the dryer sheet cape that Frankie makes. I wanted my hybrid (Fogmound series) reader to read it next, but another friend was looking for a book when the first two finished, so we gave it to him. I'm pretty sure this is a book that will eventually make a complete circuit of my 4th grade classroom. And we're already looking forward to the next book in the series! "I just turned in my manuscript for Frankie #2: FRANKIE PICKLE AND THE PINE RUN 3000 (the Pinewood Derby meets Speed Racer), and am writing Frankie #3: FRANKIE PICKLE AND THE MULTIPLYING MENACE (math meets Lord of the Rings). The plan is to do at least a dozen of them, with two coming out a year. Definitely keep me in mind for school visits next year too. I have a couple of fun programs I'm putting together where the kids help me write a little adventure and then I do a drawing of it, or one where I help them make their own comic. By next school year I'll have galleys for the next two books. #2 is due next February, but we are trying to move it up to this November." Used with permission of Kevin Henkes and Greenwillow Books. Bryant, Jen. (2008). Ringside 1925. New York: Alfred A. Knopf/Random House. Giovanni, Nikki. (2008). Hip Hop Speaks to Children: A Celebration of Poetry with a Beat. Naperville, IL: Sourcebooks. Greenberg, Jan. (2008). Side by Side: New Poems Inspired by Art from Around the World. New York: Abrams. Thomas, Joyce Carol. (2008). The Blacker the Berry. Illustrated by Floyd Cooper. New York: HarperCollins. Weston, Robert Paul. (2008). Zorgamazoo. New York: Penguin. Almond, David. (2008). The Savage. Illustrated by Dave McKean. Cambridge, MA: Candlewick. Bartoletti, Susan Campbell. (2008). The Boy Who Dared. New York: Scholastic. Bauer, Joan. (2008). Peeled. New York: Penguin. Giff, Patricia Reilly. (2008). Eleven. New York: Wendy Lamb/Random House. Lowry, Lois. (2008). The Willoughbys. New York: Houghton Mifflin. Nicholls, Sally. (2008). Ways to Live Forever. New York: Arthur A. Levine/Scholastic. Alley, Zoe B. (2008). There’s a Wolf at the Door. Illustrated by R.W. Alley. New York: Roaring Brook. Berk, Ari. (2008). The Secret History of Giants. Cambridge, MA: Candlewick. Morales, Yuyi. (2008). Just in Case: A Trickster Tale and Spanish Alphabet Book. New York: Roaring Brook. Prineas, Sarah (2008). The Magic Thief. New York: HarperCollins. Reeve, Philip. (2008). Here Lies Arthur. New York: Scholastic. Bryant, Jen. (2008). A River of Words: The Story of William Carlos Williams. Illustrated by Melissa Sweet. Grand Rapids, MI: Eerdmans. Deneberg, Barry. (2008). Lincoln Shot: A President’s Life Remembered. New York: Feiwel and Friends/MacMillan. Dray, Philip. (2008). Yours for Justice, Ida B. Wells: The Daring Life of a Crusading Journalist. Illustrated by Stephen Alcorn. Atlanta, GA: Peachtree. Nelson, Scott Reynolds, & Aronson, Marc. (2008). Ain’t Nothing but a Man: My Quest to Find the Real John Henry. Washington, DC: National Geographic. Prelutsky, Jack. (2008). Pizza, Pigs, and Poetry: How to Write a Poem. New York: Greenwillow Books/HarperCollins. Scieszka, Jon. (2008). Knucklehead. New York: Penguin. Chen, Chih-Yuan. (2008). Artie and Julie. Alhambra, CA: Heryin. Choung, Eun-Hee. (2008). Minji’s Salon. La Jolla, CA: Kane/Miller. Cottin, Menena. (2008). The Black Book of Colors. Illustrated by Rosana Faria. Toronto, Canada: Groundwood. Gravett, Emily. (2008). Little Mouse’s Big Book of Fears. New York: Simon & Schuster. Johnson, Stephen T. (2008). A is for Art: An Abstract Alphabet. New York: Simon & Schuster. Reibstein, Mark. (2008). Wabi Sabi. Illustrated by Ed Young. New York: Little Brown. Rumford, James. (2008). Silent Music: A Story of Baghdad. New York: Roaring Brook. Seeger, Laura Vaccaro. (2008). One Boy. New York: Roaring Brook. 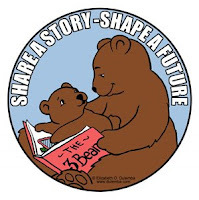 This post is part of the Share a Story - Shape a Future Blog Tour for Literacy. The focus of Day Two is "Selecting Reading Material." The complete schedule for the week-long blog tour can be found here. Stenhouse Publishers has sponsored this stop on the blog tour, and this stop is cross-posted on their blog. In 2002, Stenhouse published my book, Reconsidering Read-Aloud. I'm proud to say that in the seven years since then, I haven't stopped reconsidering the content or the function of read aloud as a part of the balanced literacy approach I take in my classroom. I read much more nonfiction aloud. I read aloud more frequently during the day now, and often for shorter periods of time. I don't finish every book from which I read aloud -- sometimes my read aloud is a preview or a "book hook." I read aloud nonfiction to teach or review or reinforce content. When we were studying weather, I read aloud THE SNOW SHOW: WITH CHEF KELVIN by Carolyn Fisher. It was a fun way to review the concepts of evaporation, condensation and precipitation. I read aloud nonfiction to introduce or review the structures of nonfiction text. The student population of my school is very diverse. I read ONE WORLD, MANY RELIGIONS by Mary Pope Osborne to promote discussions about our similarities and differences, but we wound up noticing the way each section was organized, the way the chapter and topic headings alerted us to get ready for new information, and the way a topic sentence in a paragraph promoted accurate predictions about the information that followed. I read aloud nonfiction to model thinking strategies. I didn't read aloud all of WATER HOLE (24 HOURS) by Zahavit Shalev (DK), but I wanted my students to know how to make sense of all of the information that's presented on each page. As I read aloud the first couple of pages, I talked about how my eye was moving across each page. I flipped back and forth to show them some of the features that mark time on each page. I asked questions, made connections, and ooh-ed and ahh-ed at the cute baby elephants (and at the recycling process that takes care of the massive amounts of elephant dung that the herd leaves behind!). I read aloud nonfiction to tempt my students to read it more often. All I would have had to do to sell THE WORST-CASE SCENARIO SURVIVAL HANDBOOK: JUNIOR EDITION by David Borgenicht and Robin Epstein would have been to read aloud a few of the topics in the table of contents (How to Soothe a Peeved Parental Unit, How to Survive Outdoor Chores, How to Deal with Poo on Your Shoe). I did that, but then I read just one complete section: How to Survive Farting in Public. The book hasn't been back on the shelf since. In another example, I tempted my students by reading one entry in HOW BIG IS IT? by Ben Hillman and they went on to read every entry in all of his books in the How Big/Strong/Fast Is It series. I read aloud nonfiction that doesn't look or act like nonfiction to challenge my students' thinking about genre. TALKIN' ABOUT BESSIE by Nikki Grimes. Is this a biography? But it's written in poems! And the poems are all from different points of view! And finally, most of all, I read aloud nonfiction for the sheer enjoyment of it -- for the talk we have -- for the connections and questions and WOW moments that come when young people learn about the way their world works, about the people who have made their world what it is, and about their place in our amazing world. I'm slightly goosebumpy about this coincidence: Last year on almost exactly this date I wrote about how my one example of Stories That Dovetail in the Middle had suddenly turned into a collection of three. Here's the newest addition to the collection. It doesn't quite fit because you can't read it from either end towards the middle. However, it DOES have a two stories that work towards and away from the middle, so I'm including it! In the middle, both young animals are deemed to be sufficiently trained to venture out on their own. Both Artie and Julie get distracted by a jellyberry patch. Their stories come together full-page when a storm comes and they both seek shelter in a cave. By the time the sun comes out, they are friends. Their stories split again when they return home, and they each tell a new story to their parents that night -- the story of how lions and rabbits can become friends. "It is my hope that children from all over the world can learn to accept different people and things, and see the world with broader views and minds." Chih-Yuan Chen lives and works in Taiwan. Born in 1975, Chen is tall and thin, and does not like to wear suits. He does, of course, like to take walks. This past Monday, we celebrated Read Across America in the library at our school. I have trouble planning for these one-day celebrations. I know that literacy is built over a lifetime and that one day celebrations are not the real work of literacy teaching. But, I wanted to do something that would be fun for the students and that would familiarize them with many of the books in the library. So, I came up with about 20-25 ideas--books that invited "things to do". Books that kids could have fun with. We set up the library with 20 tables filled with books and activities that kids could do around books.We have the best library aide in the world and we worked together to get it all ready in time. Our art teacher is also incredible and he ran a table where kids did painting like Eric Carle. It was quite a busy station and the kids had a ball painting. Our Enrichment teacher filmed students who wanted to talk about their favorite book. Our Technology Support Teacher worked with kids to create bookmarks on Comic Life. The day was a hit. Kids had fun and adults were exhausted! This week, a few kids started asking for some of the Origami books and paper airplane books. Everyone had fun around books and kids got their hands on lots of book that I hope they'll ask for again! GREAT NEW NONFICTION: HOW MANY BABY PANDAS? I picked up a great new book at Cover to Cover last week called HOW MANY BABY PANDAS? by Sandra Markle. You can never have enough nonfiction books about animals and this one is one that kids can enter at so many levels--there is so much about it that is wonderful! First of all, it can be read as a counting book. Counting from 1-8, we watch the phases of a baby panda's first year. On the left side of each page is a gorgeous photo of a panda (or pandas) at some point in that first year. The number of pandas is in red with the word version of the number underneath. The page then has a question like "How may pandas are taking a nap?" With that photo and small amount of text, readers can learn a bit about pandas. On the right side of the page, more photos and more information is given about pandas. These paragraph blurbs are perfect for readers--lots of information but not too much. There are also added boxes with extra information throughout the book. The final question in the book is the critical one: How many pandas live wild and free? Extra trivia, a glossary, a map, author's note and great websites for more research are added at the end of the book. This book has everything you could want in a nonfiction book and who doesn't love a panda? Kids of all ages will love this book. I can see using it in lots of ways--for leisure nonfiction reading, to use as a mentor text as a model for nonfiction writing, and more. Why do roses need their thorns? Some things are little known. There have been a few thorns in my life this week. It's good to remember the necessity of their pain "to hold us true;" good to be sure of our blooms, no matter what the cost. Anastasia has the round up this week at Picture Book of the Day. We're up to 119 on our list of Cool Teachers in Children's Literature. Cool Gate has The 15 Most Inspiring Teachers in Films. Would it be okay if I worked on being cool and inspiring instead of doing report cards? Last year, my 9 year old decided that she did not want gifts at her birthday party. She had heard about other kids who had used their birthday party as a way to give back to a cause they cared about. She knew she wanted to do something, but she wasn't sure what. I happened upon the organization THE READING VILLAGE and shared the site and mission with my daughter. Since Guatemala and literacy are two things that we care deeply about, we knew that this was the right fit. For Ana's birthday, she asked her friends to bring books written in Spanish, instead of a gift for her, to the party. After the games and crafts, Ana opened the presents which came wrapped. Kids loved watching as each book was opened. The variety of books we received was amazing. Kids often chose books that they loved when they were younger to share with the children in Guatemala. These books were sent to Linda at THE READING VILLAGE and Ana plans to do things like this for all of her upcoming birthdays. As a parent, this birthday party was perfect. Since presents were not the highlight as they often are, the kids enjoyed each other and being together. They also enjoyed the fact that they were celebrating a birthday by giving something to others. Such a different kind of a party. Ana recently attended party and the little girl collected things for the Humane Society at her birthday party. I love to see kids who find causes they believe in. I often worry about what service learning will turn into in schools if whole schools or whole classrooms take on projects that do not mean much for each student. When the teacher or the school chooses a cause, we take away students' role in finding and contributing to causes they care about. I think it is so important for kids to find causes that matter to them, personally, and to find ways to make a difference. If you have not had a chance to hear Dr. Tim Tyson or to visit his blog, it is inspiring for educators. His goal: Using Technology to Empower Meaningful, Global, Student Contribution. Spend some time on MabryOnline looking at the contributions these students are making and it is happening in school. Kids have always been amazing in the way they work to make the world a better place. But, I think the tools of the 21st Century have made it easier for them. The tools make it possible for everyone to know about issues that concern them and to make global contributions--no matter how old they are. Our children have learned to use these tools in powerful ways. I am amazed that children so young are so selfless and have been finding so many ways that children are making such a difference in the world. Not surprised, but always amazed by children. And inspired. So, I thought I'd take a few minutes to share all of the amazing things I have found lately--where kids are making a difference. I know there are others and so many more that are never made public, but here are a few that I've found recently, that I thought might inspire others. Enjoy and be inspired! How difficult is it to do a little something helpful now and again? Is it really that tough to pick up an errant piece of trash and dispose of it properly? Does it really cramp our style to hold the door open for someone? To improve some one's day by offering a simple smile? In this age of jam-packed schedules, never-ending technological distractions, and rush-rush-rush attitudes, are we really so busy that we can't lend a hand now and again? I love following them and their mission. So many ways to do good in the world. This Public Service Announcement was produced by Noah Gray, a 16 year old, WE NEED A NEW "R" WORD. It is a very powerful video and will definitely make a difference in people's perceptions. Created for the Special Olympics. Following this first video, youth delegates created this video in the reaction to the use of the "R" word in Bill O'Reilly's show airing February 9. This clip is as powerful, if not more powerful than the first one. A video created to answer the question, "What does Special Olympics mean to you?" Zach is the creator of LITTLE RED WAGON. The number of projects that this 5th grader has already done is amazing. He has done many many things in the past few years to support different causes. His site is inspirational and the videos he has included add to the understanding of his mission. A boy who is making a huge difference in the world. In December of 2007, I decided that the best way to remember my grandpa during the holiday season would be by living my life like he did, by making a difference and being a leader. I decided to honor my grandfather’s memory by trying to make a difference every day for twenty five days. I wanted to be able to do little things, like kids my age typically do, instead of HUGE things that are sometimes hard for kids like me. I decided to write about my adventures here, and I also created a challenge. How about Capucine who I learned about from Stella at Mi World-Mi Mundo. Capucine, a four year old, is helping to make sure that her friends in Mongolia have books. She would like to open a library for them. 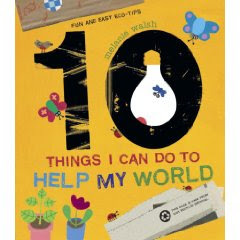 Capucine already understands the power of her words, the Internet, and making a difference.The new book 10 THINGS I CAN DO TO HELP MY WORLD by Melanie Walsh is a great one to start conversations with kids on contribution. I also think they would be inspired by seeing some of the things other kids are doing. I know I am.